Theatrical Outfit presents I LOVE TO EAT! 1984. Manhattan. "In the beginning there was Beard," said Julia Child of the first TV chef whose charisma transformed him from aspiring actor to culinary expert. A flamboyant yet introverted gastronomist, James Beard was his own greatest promoter and harshest critic. He weathered shifts in foodie culture for half a century, and the award bearing his name today is craved by chefs worldwide. Drop into Beard's Greenwich Village kitchen for bean-spilling anecdotes, on-air flashbacks, and a salty voyage around the world of love, life, and comfort food. Sit close and sample a taste! Theatrical Outfit presents I LOVE TO EAT! 1984. Manhattan. "In the beginning there was Beard," said Julia Child of the first TV chef whose charisma transformed him from aspiring actor to culinary expert. 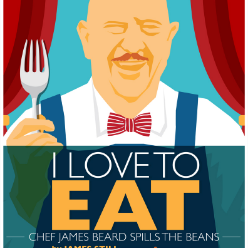 A flamboyant yet introverted gastronomist, James Beard was his own greatest promoter and harshest critic. He weathered shifts in foodie culture for half a century, and the award bearing his name today is craved by chefs worldwide. Drop into Beard's Greenwich Village kitchen for bean-spilling anecdotes, on-air flashbacks, and a salty voyage around the world of love, life, and comfort food. Sit close and sample a taste!